A bouquet of roses? Ha! Kylie Jenner was greeted with hundreds of roses, and complementary candles, inside her Hidden Hills home on Nov. 6. See the unbelievable display of (presumably) Travis Scott’s love! It’s Election Day, not Valentine’s Day. Still, Kylie Jenner, 21, just walked into one of the most lavish surprise we’ve ever seen on Nov. 6. 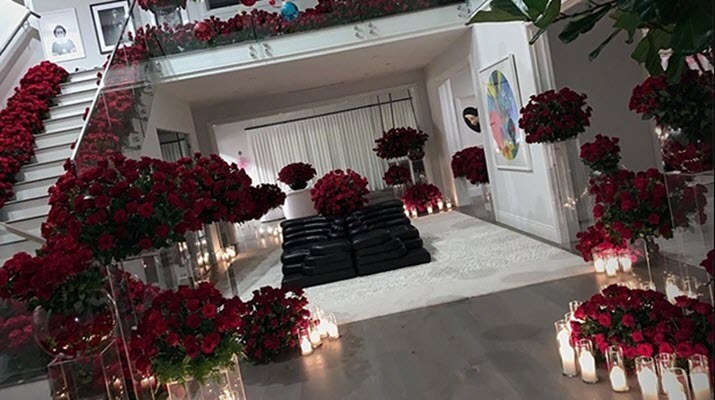 To cap off a day of voting, the Kylie Cosmetics CEO came home to her foyer, stairwell and upstairs balcony adorned with bouquet upon bouquet of roses and candles, which she shared to her Instagram Story and feed. Seriously, we’re now concerned if there are any of the red flowers left for next Feb. 14! Kylie even paused from filming the romantic surprise to pose for an adorable selfie with her nine-month-old daughter, Stormi Webster. While it’s unclear what occasion the roses and candles were celebrating, and who they’re from, we have a good hunch her baby daddy Travis Scott, 26, is the mastermind. Travis’ 2013 track, “Hell Of A Night,” played in the background of Kylie’s Instagram videos on Tuesday night. And the makeup mogul once again referenced her boyfriend in the caption of her official post! “Hella way to end the night 🌹♥️,” she wrote, an obvious wink at Travis. Social media clues aside, we already knew that the hip hop chart-topper has a thing for roses. He surprised Kylie with 443 of them after she gave birth to their first child in February! “443 from my ❤ a few days ago. the time she was born 😊,” Kylie wrote over a picture of the floral surprise on Feb. 5, referencing the time Stormi was born — 4:43 p.m. on Feb. 1! We’re not only tearing up because Travis is the modern day Romeo. We don’t know how much longer Kylie will be filming from inside her Hidden Hills abode! She and Travis just purchased a $13.45 million mansion together in the Beverly Hills Post Office neighborhood of LA, according to a Oct. 25 report from TMZ. The move will be bittersweet, as it’s a major milestone for the new parents, but it’ll also distance Kylie even farther away from the Kardashian clan in Calabasas. Even her ex-boyfriend Tyga, 28, is feeling some type of way about the impending move! As we’ve told you, the “Taste” rapper “became hot when he heard that Kylie and Travis were buying a huge mansion in the hills,” and “doesn’t want to believe it,” according to what a source EXCLUSIVELY told HollywoodLife on Oct. 25. Whew, Travis just set the bar impossibly high for lovers everywhere. What else do you expect from the rapper who gifted Kylie a vintage ’50s Rolls-Royce for her 21st birthday on Aug. 10?